New this year is a raffle quilt with 90% of the proceeds going to the American Porphyria Foundation. The chances are $2 for one or three for $5. The raffle will take place at the Tea on March 12, 2016. To purchase tickets, contact dokeefe19@hotmail.com. 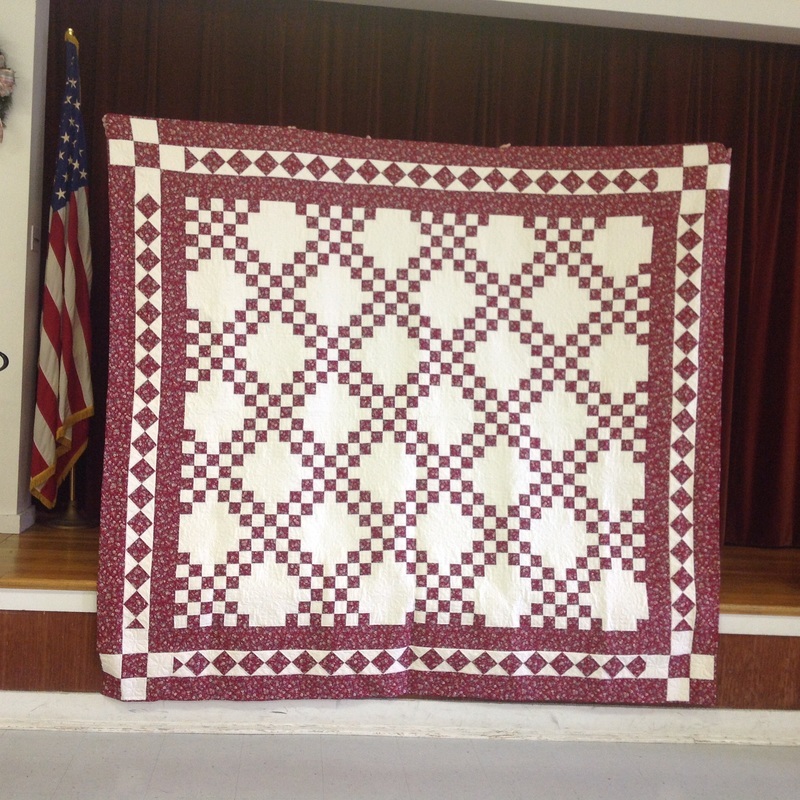 The quilt is a lovely red and white queen size Double Irish chain, quilted by Cat's Eye Studios. See picture below. Porphyria is a group of 7 genetic blood disorders where blood is correctly manufactured by the body only 50% of the time. All of the porphyrias change the blood chemistry of the patient making all typical medications potentially deadly to the sufferer. They are only now discovering how to diagnosis and treat these disorders which are life changing and life threatening. Most people have never heard of porphyria, including many doctors, so few donate funds to this non-profit organization dedicated to educating medical professionals and performing research. These disorders have been a bane to humanity for centuries. The vampire myth was actually based on one type of porphyria that causes the person’s skin to bubble when exposed to UV light. Recent Porphyria News (Wed, Nov 18, 2015): The American Porphyria Foundation just announced that they and their FDA Committee will be leading a FULL SPEED AHEAD charge to gain FDA accelerated approval of Afamelanotide/SCENESSE, the new treatment for erythropoietic protoporphyria (EPP), a rare disease which causes absolute intolerance of patients' skin to light. NOTE: EPP is only one of the seven types but this is a start. This treatment is currently available in Europe.